High pressure sodium lamp, 150W, E40, 2000K, DURA DURA sodium lamp with 150W power consumption, socket E40 and color temperature 2000K. It is suitable for street lighting, public buildings, restaurants, shops and large living quarters. List Price: 12.90лв. VAT Incl. High pressure sodium lamp, 100 W, E27 High pressure sodium lamp, 100 W, E27. List Price: 11.50лв. VAT Incl. High pressure sodium lamp 250W E40 High pressure sodium lamp 250W E40. Sodium lamp DURA HPS -250W, E40, 2000K, 1000lm Sodium lamp with a power consumption 250 W, base E40 and color temperature of 2000 K. Suitable for large premises, public buildings, restaurants, shops and more. A sodium vapor lamp is a gas discharge lamp that uses sodium excited state tо generate light. 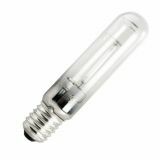 There are two variations on this type of bulbs according to their working pressure: the low pressure and high pressure. Sodium low pressure lamps are the most efficient electric light sources, but their yellow light is often limited in use in outdoor lighting projects such as streetlights. On other hand, sodium high pressure lamps have a broader spectrum of light, but in a poor color reproduction in comparison with other types of fixtures. Since sodium lamps cause less light pollution than mercury vapor lamps many cities use them as their lighting solution. Welcome to visit us for latest models and offers or shop online from your home and office with fast and cheap delivery!